Are you ready to face the outdoors for all day full of play and relaxation? Spending the day at an outdoor water park is a fun way to spend a hot summer day. From fun wading pools to thrilling water slides there is something for everyone. Water parks are a great destination for family fun, couples, or organized groups. 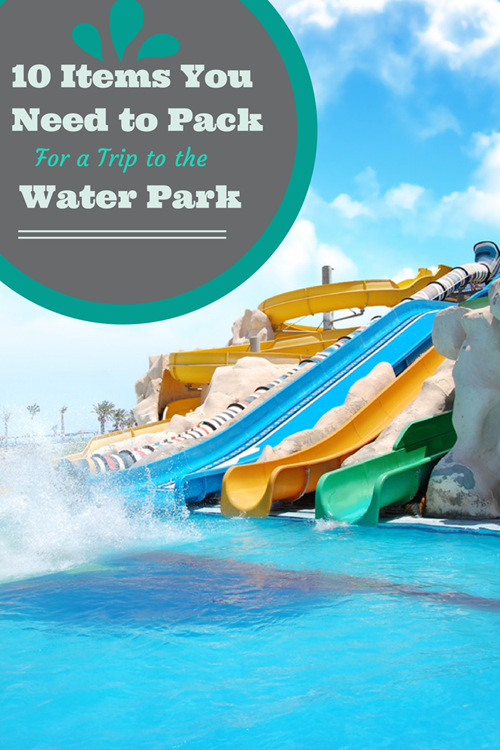 To make your trip stress free and enjoyable, it is important to be prepared and create a list of things to pack for a water park. Many people take too many items to the park with them. There is often limited space for storing personal items. Always contact the park before visiting to see if storage lockers are available for valuables that cannot be taken along while swimming or on rides. Cash: Most water parks do not allow visitors to bring food and drinks into the water park area due to the fact that they have their own vending areas to sell food and drinks to customers, so it is best to bring some cash in case you become hungry or thirsty. Bringing along a waterproof money holder is one way to keep cash and credit cards safe. Sunscreen: People of all ethnicities and skin tones can experience sun damage. Wearing sunscreen is essential to prevent unwanted burning and discomfort. Many varieties of sunscreen are resistant to the water and will stay on for several hours after the initial application, but be sure to re-apply throughout the day. Water Shoes: Walking on the bare surface of the water park for several hours can cause blisters and sore feet. The surfaces may change in each area that is visited. Hot concrete can burn and be uncomfortable during the hottest hours of the day. Water shoes work well for people of all ages to walk safely on slick surfaces around the park. Towels: This may sound obvious, however on our last trip, we totally forgot to bring towels with us. Doh! They’re usually pretty pricey at water parks so be sure to bring your own. Waterproof Cell Phone Case: In the past, I used to miss out on a ton of photo opps because I used to place my cell phone in a locker for safe keeping. I recently purchased a set of clear waterproof cell phone cases for both Philip and I that allows us to still use all of the phone’s functions while protecting it from water damage. First Aid Kit: I tend to get headaches when I’m out in the sun for a very long time, so I always make sure to pack some pain relievers. Also, on our last trip, a little girl stumbled and scraped her toe which resulted in some bleeding so it’s also a good idea to pack a first aid kit, and at the very minimum, some bandages and antiseptic towelettes just in case. Hair Accessories: Hair accessories may not be a priority for the males in your family that will be going to the water park, however, having hair accessories is a must for female water park visitors. Some hair accessories to consider are a vent brush, detangling comb and hair clips to put hair into place before, during and after a trip to the water park. Oh, and most parks have showers you can use so don’t forget to bring shampoo and conditioner to use when you’re all don having fun. Plastic Bags: Remember all those plastic bags that you have stored in your kitchen cabinet? You can use those plastic bags as a place to store wet bathing suits, wet clothes and swim trunks. Dry Clothes: I don’t know about you, but sitting in wet clothes on the drive home is not fun, so don’t forget to pack extra clothing that you can change into. Water: Staying hydrated is key to ensure that you and your family will have a safe trip while visiting an outdoor water park. Drinking 16 ounces of water, 30 minutes before entering the water park, would be wise to ensure hydration upon your arrival; just remember to drink at least eight ounces of water once every hour to prevent overheating and to stay hydrated. Traveling to a water park is one way to experience a great time without heading to the beach or a crowded neighborhood swimming pool. Confirming the packing list is the best way to make sure essentials are within reach. reviewing the park when arriving to the park is the best way to know exactly which direction to visiting the best attractions. Use these tips when planning a day of fun in the outdoor water park. Good tip. I usually bring water but as for snacks, it usually depends on where we’re going because some don’t allow outside food. Love The Tips I Usually Over Pack LOL! You Can Never Have Enough Sun Screen Thank You!! I am saving this list for all our summer adventures! oh thank you i always forget to pack plastic bags for the swim suit – we are going to a water park next week. Great tips! We have a small waterpark right by our house and we have been spending a lot of time there already this year, but I never remember to bring plastic bags! Mental note made! Thanks! Dry clothes are so important! I’d hate to sit in a wet bathing suit the whole way home in an air conditioned car. Yuck! Yea! summer is here… let the fun begins. Waterproof cell phone case? I’ve never seen one of those. Your item list is definitely complete… I could not not think of anything else outside this list. Bringing along plastic bags to store the wet suits and towels is a definite must. I never thought about showering and washing hair afterwards! All great tips! Definitely cannot forget the sunscreen! Great list! We just got back from an indoor water park – loved no need for hats, shirts and sunscreen! Great tips, I always feel like I am moving out when we go to places like that because times all that with 5 kids. these are some great tips. with summer here i am definitely going to follow these tips. Wonderful list, especially the dry clothes. Cant tell ya how many times Ive gone and gotten my sun dress soaked and needed a spare change! Great tips! I’ll have to keep this handy this summer! Instead of waterproof phone cases, you could use a zip lock bag.